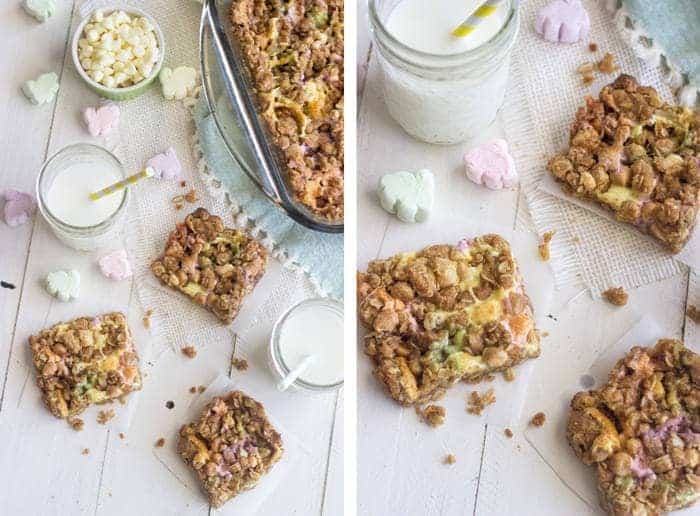 These Oatmeal Bars with Chocolate and Marshmallows are the easiest, 30 minute dessert that you will ever make! 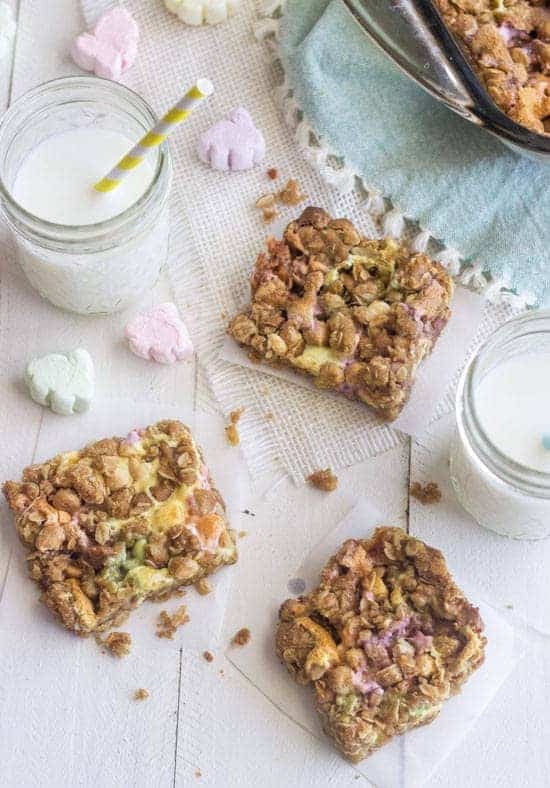 They are loaded with pastel marshmallows, chocolate and chewy oatmeal! You get these awesome weekends that just fly by and then, BAM, Monday. I cry. You cry. We all cry. What was the highlight of your gone-to-fast weekend? Mine was this Froot Loop Breakfast Square that my mom shared on Instagram. That, my friends, is what happens when my mom is sick and my dad makes breakfast. My family is insane. And I totally and completely love them for it. Side note: I am going back to visit them next week for the first time since we moved to Florida last November! I AM SO EXCITED. But, we’ll talk about that later. Actually, I lied. We’re kind of going to talk about my family, my child hood and life growing up in Canada today. When I word it like that, it makes it seem like growing up in Canada was rough and hard. It’s not. Unless one of your sled dogs got sick and you had no means of transportation. Then it was a rough day. Like Apple platz, “square” was at every family gathering AND it was brought to every single Church potluck that I can remember. And that, peeps, is a lot of church potlucks. It’s just ALWAYS a hit and everyone always wants the recipe. Now, you are looking at me with questioning eyeballs and going “ummm, what’s square?” This Chocolate Oat Square is “square.” My brother and I (did you know that I have a twin brother? Now you do!) were teeny tiny (not much has changed for me…he’s 6’2) when we first tried these squares, and saying “Chocolate Oat Square” was just too long and confusing for our tiny little child brainsies. So, we called it like is, and “square” was born. Just to, you know, confuse all the people. 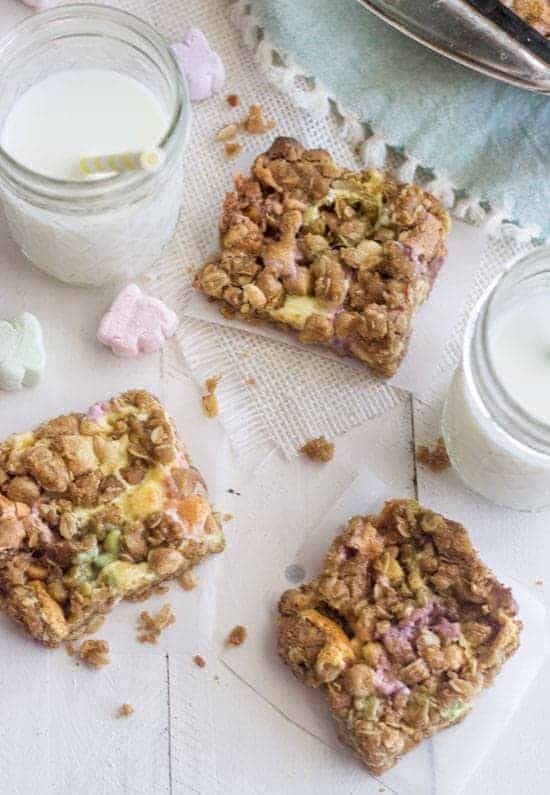 Originally this square is made with milk chocolate chips and regular colored marshmallows. How-ev-er….it’s almost Easter, so white and dark brown just ain’t gon’ cut it in the FFF kitchen. AND I found these amazing pastel marshmallow bunny heads at Walmart! Whomp Whomp Whomp. Excitement = dead. Whatever. My stomach knows that they were cute before the meltage, which makes it like them even better. That makes sense right? Don’t answer that. The best part about these squares is that they are SO EASY. Like they-are-made-and-baked-in-almost-30-minutes kind of easy. 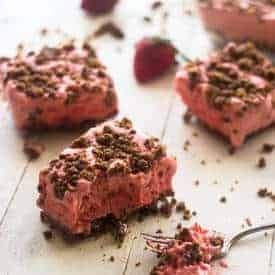 Like anytime-you-have-a-dessert-craving-you-can-make-them-except-you-probably-shouldn’t-because-you-will-want-to-eat-the-whole pan kind of easy. But really, I switched the all purpose flour and butter for whole wheat pastry flour and coconut oil, so you COULD eat the whole thing. Maybe. Don’t take all the advice I give you. I bet you have everything you need right now. Except maybe the marshmallow bunnies. You should get those. They’re cute. And bunny shaped. And, If you take my crazy triangle advice, let me know how that turns out. Preheat your oven to 375 degrees and spray a 9x13 inch baking pan with cooking spray. Set aside. With an electric hand mixer, cream together the coconut oil and brown sugar until smooth. Stir in the flour, oats, baking soda and salt and mix until well combined. Set aside about 1 1/3 cup of the crumbs and press the rest of the crumbs into the bottom of the prepared baking pan. Sprinkle the marshmallows and chocolate chips over the pressed crust evenly. 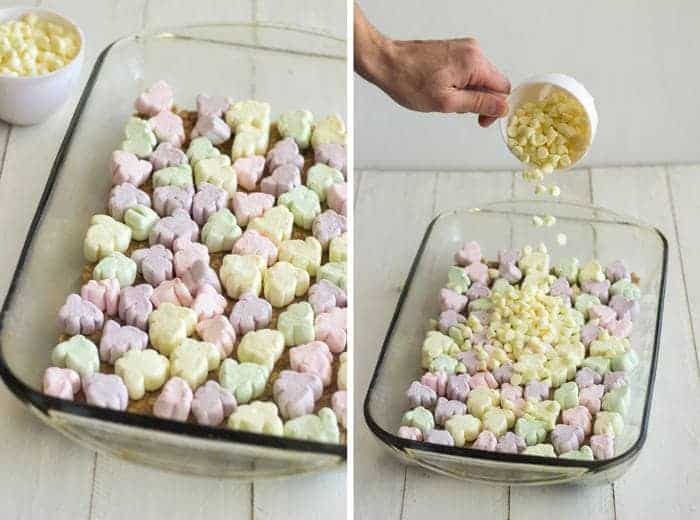 Top with the remaining crumb mixture and bake for 20-25 minutes, or until the marshmallows are just turning golden. Let the bars cool in their pan before cutting, or else the won't set and will be a a lumpy mess. Need another easy dessert idea? Melted bunnies or not, these squares look amazing. Or square? Either way, yum! Yay for going back to your home town. That’s exciting. Pinning. Monday does always come too soon. I’d love to ease the Monday blues with these pastel bunny squares…so cute! I can’t believe Easter is just around the river bend…I had better eat my fill in pastel bunny marshmallows before I can’t find them anymore for the next year! I am sooo excited!! Thanks for the pin and sweet words girlfreind! Haha he is! but I was devastated. Men…they just don’t get it! How fun that you get to visit your family next week! And I had no idea you were a twin…I love learning new things about my blogging friends. 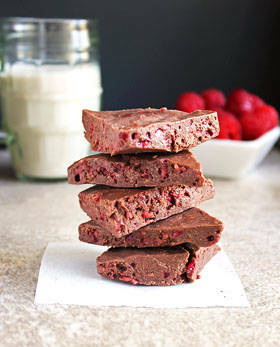 These sound ridiculously yum! And seriously do we have to call these squares dessert and limit them to ONE after-the-meal-dish? When clearly they should be the star…and eaten like ALL the time – correct? Had no clue you had a twin bro, Taylor! And glad you get to visit your folks next week! I think you’re correct.. I like that mentality! Wow….your mom is on instagram, your a twin and bunny marshmallow exist…..wow, so many things. 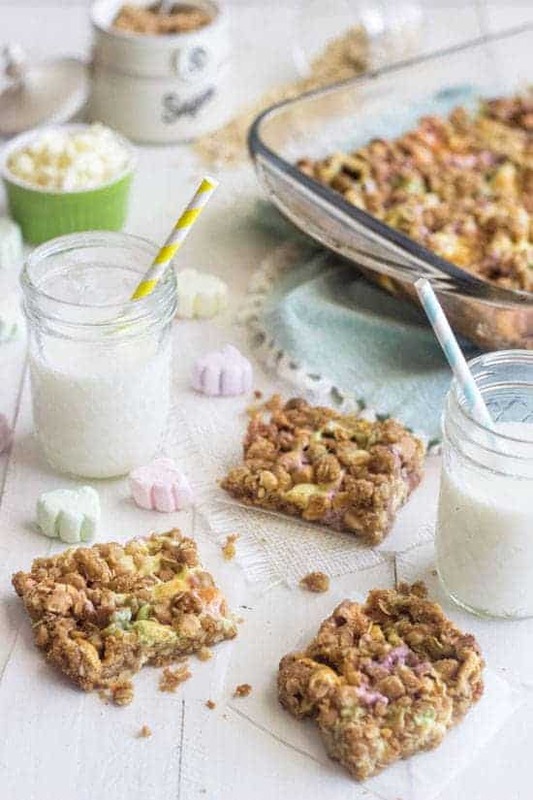 Totally digging these oat squares! Haha…this made me laugh! Thanks Kelli! Love the bunny marshmallows! 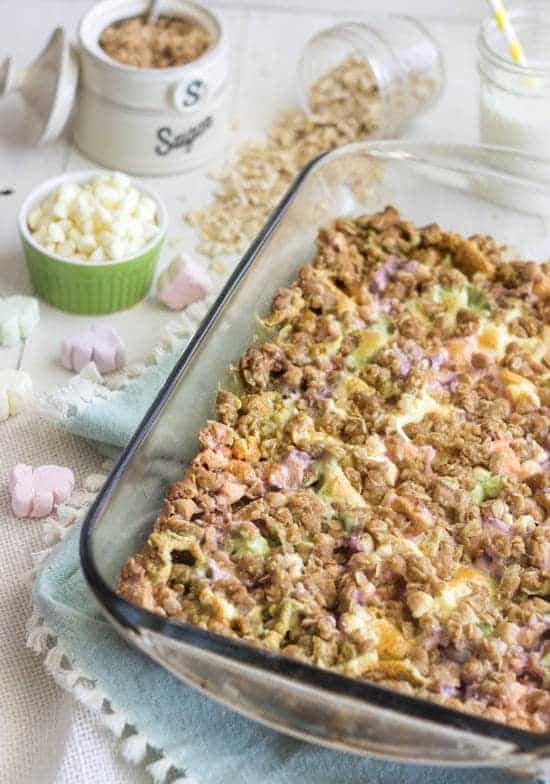 What a fun and easy Easter recipe! I can’t even with these squares Taylor! Yummy. Have a great visit with your family next week. And so cool you have a twin! Haha right?! So much adorbs. Thanks Natalie..I can’t wait to see them! These look soooo pretty Tatey! They were and still are defs a family fave, and not only did they go to every potluck but they were the only sweet treat you and trev ever wanted to bring to school for your birthday! I am SOOOOO excited to see you in less than 2 weeks now, its been 5 months!!!! Made and cooked in 30 Minutes. Awesomeness. Those easter marshmallows are just darling. I need to make an easter treat to eat soon! Pinned! Thanks for sharing 🙂 Happy St. Pattys! These look so good! I love easy recipes like this. 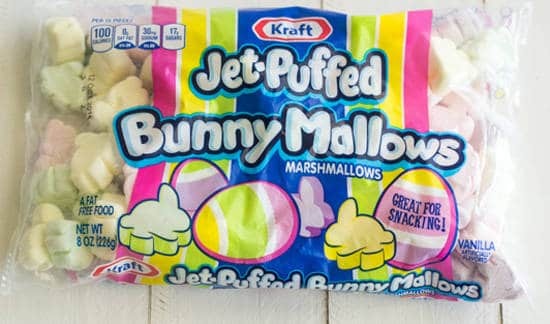 I am also very excited about pastel colored bunny shaped marshmallows, even if they will just melt! Easy recipes are the best, especially when they’re cute. I am glad that someone shares the excitement!!! Love it, I pinned it and I will make it for me children, they will love it! They’ll be a huge hit Ilona! Thanks for the Pin! Hahaha I love everything about this post. These look awesome! Definitely want to break my gluten-free-ness for these babies. Yum! Oh they would be so worth it! Thanks lovely! 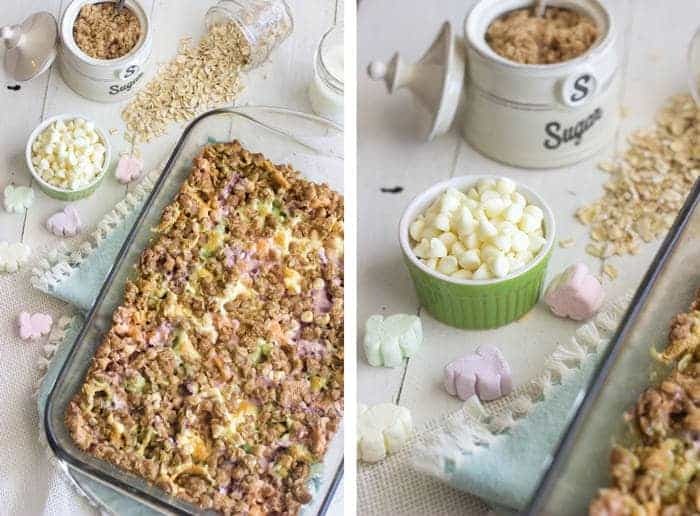 Who knew you could find soooo much cuteness in an oat square?! I am totally loving these. They look DELICIOUS! Pinned! Thanks so much for the pin Justine! Aren’t they adorbs?! Aren’t they adorbs?! Thanks for the pin girlfriend! Oooo, I know some kiddos that would love these. Thanks for sharing. These little squares are so fun! Perfect for an Easter buffet! Sled Dogs? NO WAY!!!!! I cannot wait to hear more! And that part about Mondays…you cry, I cry lol, I feel you on that front! 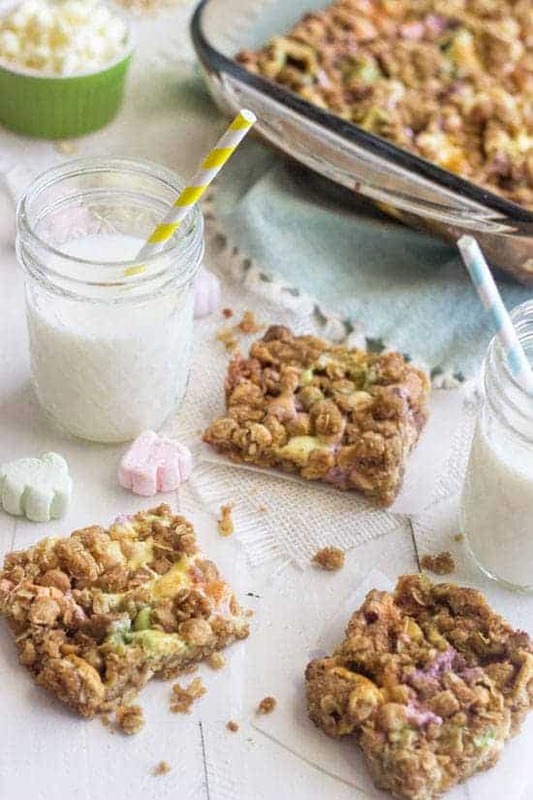 This recipe looks amazingly delicious and festive for the fast approaching Easter holiday. Monday’s really are the worst….ugh! Thanks for the sweet words! Awww I totally thought the same thing about the marshmallows! Pastels are my favorites, and bunnies? Absolutely adorable. Boys just don’t understand… My guy would’ve said something similar. Or just taken my culinary torch and made s’mores out of all of them instead. Gah. Exactly. They don’t get the “cute food” thing! I WANT A CULINARY TORCH. so jealous. LOL on your hubby’s response to the bunny marshmallows! Mine would have responded similarly! Your squares look wonderful…I know the family would love them! Yay Canada! OK, I had no idea “square” was a Canadian thing! My Canadian Father in Law talks about the “Chocolate Square” his mom would make. Now I know where he gets it! Haha I didn’t know it was either! Crazy! Did you like my home country? Thanks Gretchen! You’ll love them! 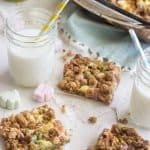 What a great desert/snack my family will love these! They definitely will! Thanks Lara! So cute for Easter Taylor! And of course delicious looking as always! Hahaha, just as you were writing about finding these marshmallows, I was thinking “they are just going to melt”…. and then saw what your husband said!!!!!!!!! Hhahahahaha! Yes, tell the husband great job. Glad we are on the same wavelength! Haha that is too funny!! You guys have the same brain! I sure was crying on Monday. But these would have cheered me right up! They look delicious, and how could those easter bunny marshmallows not make you smile?! So cute! Aren’t they adorbs!? Thanks so much Cate! I cannot get over the cuteness of these oat squares ahhh they’re adorable! And don’t get me started on those marshmallows – loveliest things on Earth! Aren’t they just the cutest eva?! Thanks Consuelo!